3 Bedroom Townhouse to Rent in Westdene Westside Ridge, Korea Road. Open plan lounge/dining and kitchen areas. 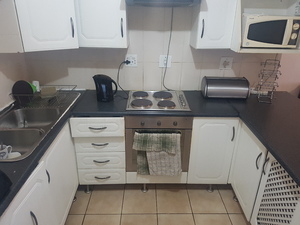 Kitchen under tiles has ample built in cupboards and a free-standing stove. Spacious lounge/dining is under tiles flooring and is open plan to the kitchen. Each of he three bedrooms has ample built in cupboard space and each will accommodate a double bed comfortably. Bathroom has shower above the bath, basin and loo. One covered carport as well as one uncovered bay allocated to the unit and pre paid electricity. Communal pool on site in this 24/7 guarded complex. Complex is within walking distance of local amenities.